With CCC Pathways estimating system we receive monthly updates on parts prices and industry standard labor studies, allowing us to present you with the most comprehensive and accurate estimate available. We perform all the necessary repairs to restore your vehicle to it’s preloss condition. Our technicians are licensed and certified in all areas as required by the State of Michigan, and together possess more than 70 years of experience. We use top of the line refinish products to provide you with the best, most durable finish. We mix our paint using computerized formulas with several color variants to ensure the best match to your existing finish – we don’t cut corners. We are competitively priced in windshield replacements. We use SRP sealers and Urethane to ensure a lasting seal. Your glass is replaced in a dry, heated shop providing the best conditions for a leak free seal. Our alignment system provides computerized specs for your vehicle – Adjustments are made as necessary to ensure your wheels are set to these specifications to extend tire life. We also inspect your suspension to check for worn parts. We offer a single courtesy car available at no cost for your use while collision related repairs are being made, though we cannot guarantee availability as we multiple customers at any given time. Your vehicle is not returned to you until it has been washed, vacuumed, and the interior cleaned – a small ‘thank you’ for your business. 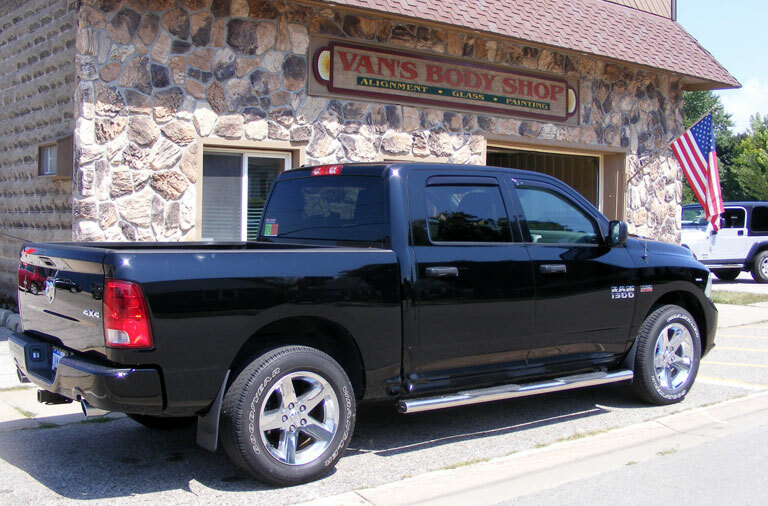 Upon your request, we will gladly pick up and deliver your vehicle within a 15 mile radius of Van’s Body Shop. We stand behind our service with a written warranty provided upon request (parts warranty is limited to the manufacturer’s warranty). In a village as small as Shelby, Michigan only businesses that consistently offer excellent service, honest labor, and quality work will survive from year to year, through good and bad economic conditions. Anything less and the entire community will know. Time is truly the test for a small, privately-owned business operating in any small community. 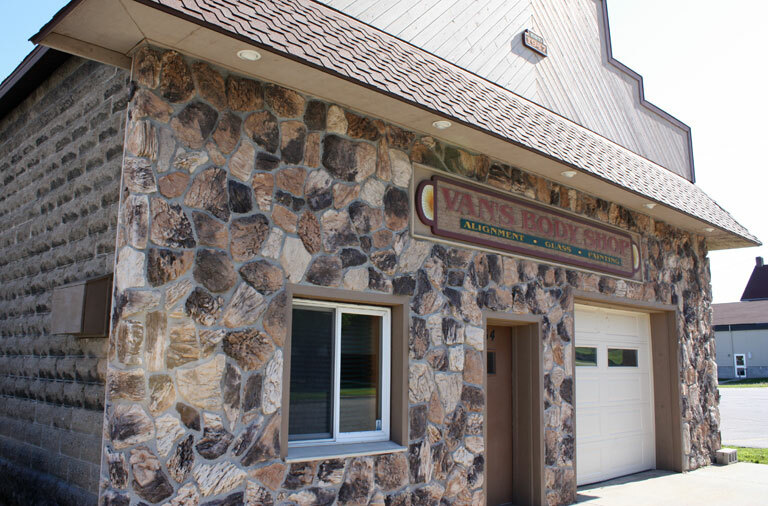 Van’s Body Shop has not only survived, but has been firmly established in Western Michigan since 1946. Van’s has also thrived under the current owners, Winston and Diane Adema, for 30 successful years, as one of the preferred auto body repair shops in Oceana County. A lifetime resident of Oceana County, Winston Adema has been in the auto body repair business since 1975 when he first went to work for the previous owner, Rich Vanderveen. He learned the trade serving as an apprentice for eleven years before purchasing the business in 1986. There have been many changes to the auto body repair industry over the years, but Winston has maintained an up-to-date shop, and consistently provides a high quality of service to his customers. Originally from Hart, Michigan, Diane Adema has worked in the Van's office since purchasing the business with her husband in 1986. Diane ensures that from the moment a customer enters the Van's office for an estimate, to the return of their vehicle following repairs, that all paperwork and customer care is handled well. Tim Priemer joined Van's Body Shop in September, 2011. Originally from the east side of Michigan, Tim has lived and worked in many different areas. With over 30 years of experience in auto body repair, Tim is a great addition to the business.